On 26 March 1918, the French marshal Ferdinand Foch was appointed Supreme Allied Commander, gaining command of all Allied forces everywhere, and coordinated the French, British, American, and Italian forces to stop the Spring Offensive, the last massive offensive of the German Empire. He was the one who accepted the German cessation of hostilities in his private train. 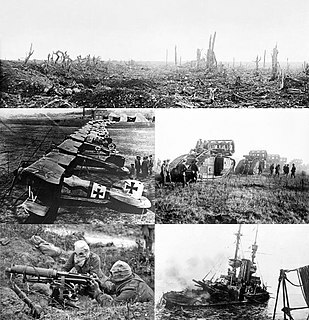 In warfare, a theater or theatre is an area in which important military events occur or are progressing. A theater can include the entirety of the airspace, land and sea area that is or that may potentially become involved in war operations. General of the Army is a five-star general officer and the second highest possible rank in the United States Army. A General of the Army ranks immediately above a general and is equivalent to a Fleet Admiral and a General of the Air Force. There is no established equivalent five-star rank in the other federal uniformed services. 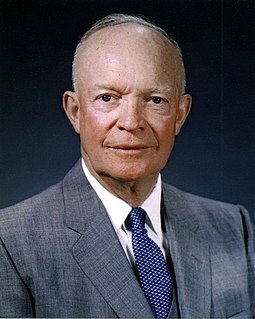 Often called a "five-star general", the rank of General of the Army has historically been reserved for wartime use and is not currently active in the U.S. military. The General of the Army insignia consisted of five 3/8th inch stars in a pentagonal pattern, with points touching. The insignia is paired with the gold and enameled United States Coat of Arms on service coat shoulder loops. The silver colored five-star metal insignia alone would be worn for use as a collar insignia of grade and on the garrison cap. Soft shoulder epaulettes with five 7/16th inch stars in silver thread and gold-threaded United States Coat of Arms on green cloth were worn with shirts and sweaters. Field Marshal Henry Maitland Wilson, 1st Baron Wilson,, also known as Jumbo Wilson, was a senior British Army officer of the 20th century. He saw active service in the Second Boer War and then during the First World War on the Somme and at Passchendaele. 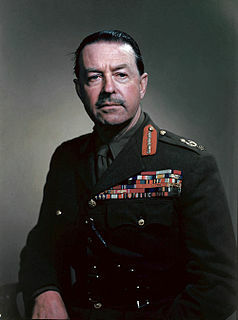 During the Second World War he served as General Officer Commanding-in-Chief (GOC-in-C) British Troops in Egypt, in which role he launched Operation Compass, attacking Italian forces with considerable success, in December 1940. He went on to be Military Governor of Cyrenaica in February 1941, commanding a Commonwealth expeditionary force to Greece in April 1941 and General Officer Commanding (GOC) British Forces in Palestine and Trans-Jordan in May 1941. Field Marshal Harold Rupert Leofric George Alexander, 1st Earl Alexander of Tunis,, was a senior British Army officer who served with distinction in both the First World War and the Second World War and, afterwards, as Governor General of Canada, the 17th since Canadian Confederation. General of the Army Douglas MacArthur was appointed Supreme Allied Commander, South West Pacific Area (SWPA) on 18 June 1942. However, he preferred to use the title Commander-in-Chief. During the Allied occupation of Japan following the war, MacArthur held the title of Supreme Commander for the Allied Powers (SCAP).The Pacific Ocean Areas (POA), divided into the Central Pacific Area, the North Pacific Area and the South Pacific Area,  :652–653 were commanded by Admiral Chester W. Nimitz, Commander-in-Chief Pacific Ocean Areas. 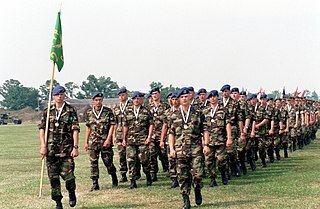 In June 2003, the commands were reshuffled. One command was given responsibility for operations, and one for transforming the military components of the alliance to meet new challenges. 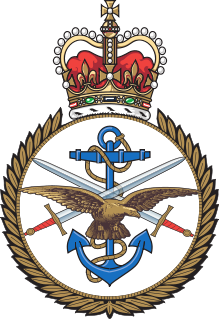 In Europe, Allied Command Operations was established from the former Allied Command Europe, and given responsibility for all NATO military operations worldwide. However, for legal reasons[ further explanation needed ], SACEUR retained the traditional title including Europe. In the United States, SACLANT was decommissioned and Allied Command Transformation established. The headquarters of ACT is at the former SACLANT headquarters in Norfolk, Virginia, USA. Each has a Supreme Allied Commander as its commander. Allied Command Operations (ACO) has its headquarters at Supreme Headquarters Allied Powers Europe (SHAPE), at Mons, Belgium. It is headed by the Supreme Allied Commander Europe (SACEUR), a U.S. four-star general or admiral also heading U.S. European Command. The current [update] (since 2016) Commander is General Curtis Scaparrotti (Army), who succeeded General Philip M. Breedlove (Air Force). Lauris Norstad was an American General in the United States Army Air Forces and United States Air Force. 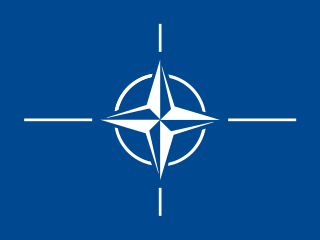 The Supreme Allied Commander Europe (SACEUR) is the commander of the North Atlantic Treaty Organization's (NATO) Allied Command Operations (ACO) and head Aoc headquarters, Supreme Headquarters Allied Powers Europe (SHAPE). The commander is based at SHAPE in Casteau, Belgium. SACEUR is the second-highest military position within NATO, below only the Chairman of the NATO Military Committee in terms of precedence. Admiral Lynde Dupuy McCormick was a four-star admiral in the United States Navy who served as vice chief of naval operations from 1950 to 1951 and as commander in chief of the United States Atlantic Fleet from 1951 to 1954, and was the first supreme allied commander of all NATO forces in the Atlantic. ↑ Messenger, Charles (2001). Reader's Guide to Military History. pp. 170–71. ↑ Milner, Samuel (1957). Victory in Papua (PDF). Washington, D.C.: United States Army Center of Military History. p. 22. LCCN 56-60004. OCLC 220484034 . Retrieved 9 July 2012. ↑ Potter & Nimitz (1960).